Cloud enterprise content management (ECM) is altering the digital workplace. Cloud-based ECM makes content available anywhere and anytime, a key feature in the era of proliferating mobile devices. But just saying that new ECM strategies can radically improve mobile development by making processes more seamless, automated, etc. is one thing. Actually implementing the necessary changes to access these benefits is another. 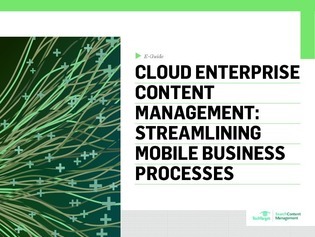 In this expert e-guide, we explore the specific challenges you face when adopting cloud ECM. Gain access to the information you need for a successful implementation so that you can start enjoying benefits like cloud-based file sharing and more.